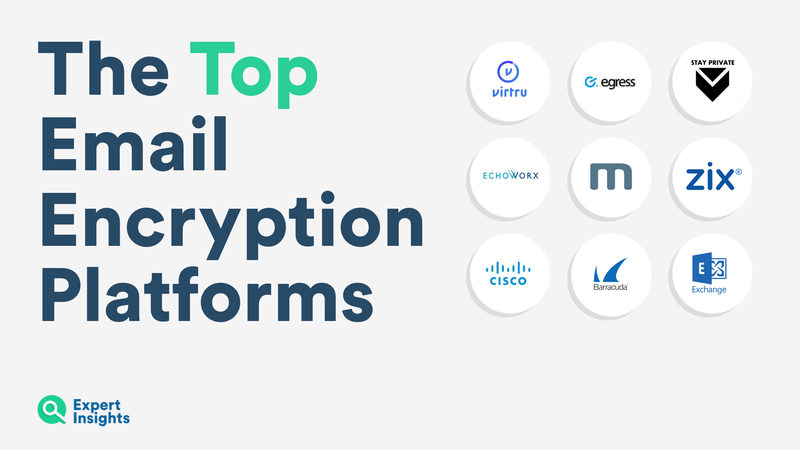 Discover the top Email Encryption platforms. Examine their features, security and reporting. Email Encryption is a vital tool for businesses to ensure that their email communications are safe. Like any form of communication, it’s possible to expose the content of emails, leaving confidential information for all to see. For this reason, businesses need to encrypt emails. This could be for legal or regulatory reasons. Or, it could be simply that a business has the information it wants to be kept out of public view. Either way, these encryption tools are crucial to keeping information sent by email safe. We’ll be looking at the methods of encryption these products offer, the admin policies on offer, how easy they are to use and the quality of reporting. Virtru offers a highly secure, market-leading encryption platform. They offer two types of encryption. One is a secure web portal, which means that end users can manually encryption an email via Outlook. The other is end to end encryption, the most secure way of encrypting emails. Virtru allows you to encrypt both emails and attachments, an important step toward better security. The secure web portal is extremely easy to use. End users select the ‘Encrypt’ button which comes as part of an Outlook plug-in. This secures the email on a secure web page. The recipient of the email simply needs to log in to this web page and they can view the email. The service is also easy for administers to deploy and offers a range of customisable policies they can roll out. This includes giving end users the ability to revoke access to emails after they have been sent. It also includes setting if emails can be forwarded. Virtru range of audits to show when emails have been opened and forwarded. This service is popular with customers, who argue that sending emails is lightning fast, and that it offers advanced features. Egress offers an Encryption service packed with features and aimed at large organizations. It offers a secure web portal method of encryption. This allows end users to send secure emails and recipients to reply, just by logging into a web interface. There are also a range of admin controls. Admins could set a policy which meant that all emails with the keywords ‘financial information,’ must be encrypted, for example. Egress also offer a good range of end user features. These allow senders to revoke access to secure emails, prevent attachments from being downloaded, and prevent copy/pasting of text. These controls are simple to use. The platform is accessible via a desktop client or as a plug-in to your existing email client. The user interface is simple. This makes replying and sending encrypted email easy. Egress Email Encryption is available as a cloud, on premise or hybrid solution. We recommend this platform to larger businesses looking for an encryption solution. You can read our full review of Egress Email Encryption here. Stay Private is a Market Leading Email Encryption service. This service has a focus on being easy to install and manage, but is still packed with good features. Stay Private offers multiple encryption options, including a secure web portal, and end to end encryption via Outlook. The secure web portal is easy for end users to navigate, with a range of features. They can share files securely, and revoke access to mistakenly sent emails. This helps to stop data loss coming from human error. They can also attach e-signatures to emails, so that contracts can be signed via encrypted communications. End users can manage all their encrypted email conversation via the secure portal app. Stay Private offers full auditing to give you visibility over where emails have been sent and when they were open. They also offer users instant messaging and attachment encryption. Stay Private is easy to install, and offers plug-ins for all major email clients. We’d recommend them to small and midsized businesses for their great features and ease of use. Stay Private also offer an on-premise solution for larger businesses. You can >read our full review of Stay Private here. Echoworx is a premium encryption platform offering six different types of email encryption. This includes a secure web portal, which allows end users to log in to send and receive secure emails. It also includes end to end encryption and Secure PDF encryption. This involves sending emails as PDF document which cannot be opened by anyone but the intended recipient. Admin’s can set custom and flexible policies, which decide which emails must be encrypted, or end users can do so via their existing email client. This means the service is easy to use, which keeping all sensitive email data secure. Echoworx provide high-quality access and audit reports, so you have visibility over who is accessing encrypted email. They also provide a good range of features such as large file encryption, to make sure that the needs of all your users are met. Echoworx offers a huge amount of features and policies. It’s biggest strength is that despite these complex features, the service is still easy to install, manage and actually use. We’d recommend this service to organisations looking for multiple encryption methods to secure their communications. You canhref=”https://www.expertinsights.com/reviews/echoworx-oneworld-encryption-platform”>read our full review of Echoworx OneWorld Encryption here. Mimecast is a globally leading security vendor for businesses. They offer an encryption service which uses a secure web portal method of encryption. This means users can send encrypted messages via their existing email client, and recipients can log in to a webpage to view them. Mimecast offer a trusted and secure platform, so you can send emails without fear of data loss. They offer a range of good features to protect data. This includes giving admins reports, but not actually letting them see the contents of an encrypted email. Mimecast also offer end user controls. This includes being able to see when an email has been read and putting restrictions on forwarding and printing of encrypted emails. End users can also revoke access if an email was sent accidentally. All of these controls are accessible from the users’ existing email service, making them easy to use. This product is not standalone, but part of Mimecast’s ‘Information Archiving’ and ‘Secure Messaging subscriptions. This means that this is a great encryption option if you are already a Mimecast customer. You can read our full review of Mimecast Secure Messaging here. ZixEncrypt offers policy-based email encryption which streamlines the process for end users. Admins set custom policies based on certain keywords, or departments. ZixEncrypt encrypts emails which come under these policies automatically. This simplifies the process for end users, as they don’t need to manually encrypt emails. Encryption works via a secure web portal, secure PDF encryption, or end to end encryption. The platform offers a ‘Best Method of Delivery’ feature, which automatically choses the best of these methods to send the encrypted email. Zix is a trusted, global security provider, so you can be sure this is a secure service, with good levels of customer support. Zix offers pre-defined encryption polices for different sectors, including healthcare, finance, public sector and education. ZixEncrypt offers great features and is a secure email encryption solution, which Expert Insights recommends. You can read our full review of ZixEncrypt here. Cisco offers a safe and trusted email encryption tool with a wide range of customisable features and policies on offer. The encryption method used here is a secure web portal. Admins can set policies to automatically encrypt emails, or end users can do so manually. The major strength of this service is the range of features it offers to end users. They can recall emails, expire access to emails and receive receipts when an email has been opened. They can also set full controls over the ability of end users to forward and reply to emails. These controls are available with the users’ normal email client, making them easy to use. Admin’s get access to reports, detailing when these controls are being used. Customers like this service for the range of end user controls on offer. We recommend this service for its range of end user controls, especially to existing Cisco customers. You can href=”https://www.expertinsights.com/reviews/cisco-registered-envelope-service”>read our full review of the Cisco Registered Envelope Service here. Barracuda Email Encryption comes as part of Barracuda’s Essentials package. This package is most suitable for small businesses. The encryption method used is a secure web portal, the Barracuda Message Centre. This platform is very easy to use and navigate and allows recipients to easily reply to encrypted emails. Admins set policies to automatically encrypt certain emails. This service requires the use of the Barracuda Outlook plug-in. This makes it easy for users to manage their email encryption from within Outlook. Using this service, admins can revoke access to encrypted emails if they have not already been read. Reports for this service are available within the Archiving module which is included within Barracuda Essentials. This product offers all the essential encryption features you need at a great price. We highly recommend this service to customers who are also looking for an archiving and email secure gateway solution. You can href=”https://www.expertinsights.com/reviews/barracuda-email-encryption”>read our full review of Barracuda Email Encryption here. Microsoft’s Office Message Encryption is a new encryption service offered by Microsoft. As you’d expect, it works directly within Outlook on Office 365. Everyone who uses Office 365 will be able to send and receive secure email seamlessly. Users using clients like Gmail can view encrypted emails in a secure web portal. This service is secure and very easy to use. It offers some useful features; users can send secure email both internally and externally very easily. It’s also very cheap and easy to implement. Admins can create custom policies, so that end users can stop encrypted emails from being forwarded. There are a few features missing, however, such as attachment encryption. There is also no reporting currently offered, but this is being added. Microsoft’s product is very new, and the lack of features reflects that. It’s very cheap and easy to implement however, and should improve over time. We’d recommend this service if you need the most basic level of encryption. You can href=”https://www.expertinsights.com/reviews/office-message-encryption”>read our full review of Office Message Encryption here. So there ends our list of the top 9 Email Encryption platforms for businesses. Each has different strengths, with some focussing on ease of use, some on flexible policy and some on multiple encryption methods. Finding the one that best suits your business is crucial to improving your security.